Majestic Senior Living is a home health care institution based in Santa Clarita, CA. It is important for creative Logo Design for a home health care to be inviting, relaxing, and friendly. This Creative Logo Design is the first thing that potential patients and families of patients will see before considering the services offered. This is why it is important to leave a memorable impression of the company at first glance. 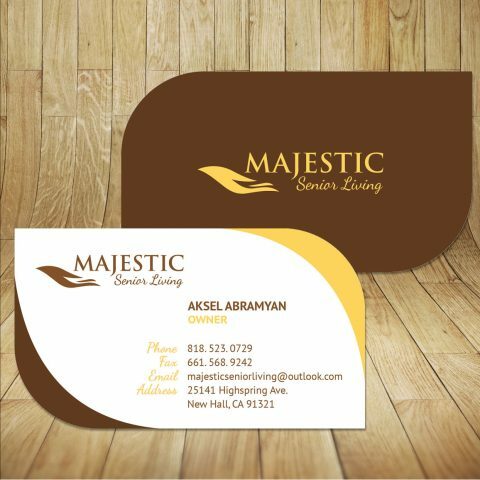 The Creative Logo Design for Majestic Senior Living is clear and to the point. In addition, contrasting typefaces fit perfectly with a soothing hand symbol. Thus, it is self-explanatory and direct. Accordingly, the brown color is reminiscent of a natural, soothing experience without any extra clutter or artificiality. The second version of the Home Health Creative Care Logo Design in Los Angeles is in a mustard yellow color. This version was used on the business card of the company. Ultimately, the two colors together create a beautiful harmony that represents what the company stands for.